This Motherhood Spectrum is a long, long line of potential phases on which you might land. It ranges from the Not Yets to the One Days, the Almosts and the Right Nows, all the way to the Yesterday Moms. Everyone has made their way onto the spectrum in their own unique way; no two stories the same. And as we scan our eyes down the line, we don’t have to look very hard to see our differences – be it our age, number of children, or arrival into motherhood – but really, we’re much more alike than we are different. If you close your eyes and listen carefully, you’ll hear the familiar, relentless beat of that one thing we all share: our mother hearts. It’s our unbreakable bond. We are connected forever in this way. And instead of just a line, picture the spectrum as a gigantic, gorgeous table, so long you can’t see where it ends in either direction. There are seats lined up one side and down the other and each woman has a place setting in front of her. 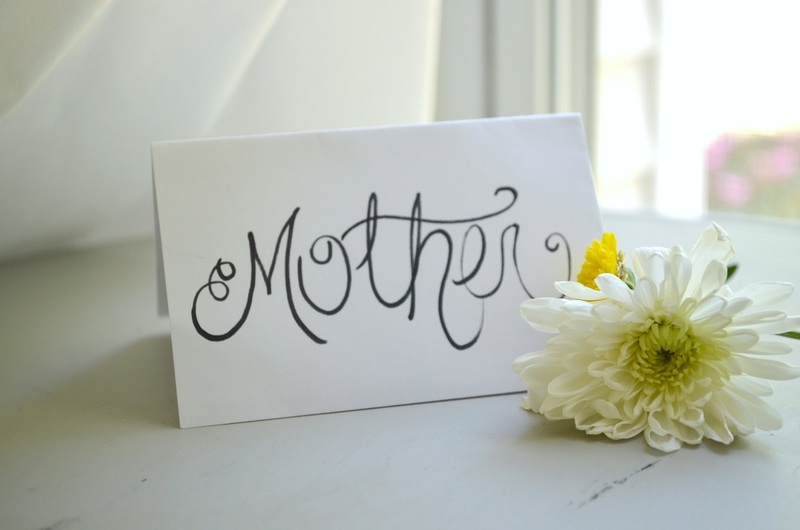 There’s a crisp white card folded in half, and written in pretty black script is that beautiful word, “Mother”. That card says you belong. We’ve saved a place for you here. Good news: there are a thousand ways to find your seat at this table, among this blessed community. More good news? There is enough room for all of us. Maybe your encounter with motherhood has been through longing birthed only in your heart so far. You believe the lie that you can’t sit down at the table yet, so instead you stand awkwardly to the side waiting on your invitation. I say, grab a seat, sister. You’re one of us. Maybe you’re knee-deep in the every day muck and glory of motherhood, with one, two, three, or ten babies calling you mama and tugging on your hemline. You can’t even sit for more than 90 seconds without someone needing your attention. It’s okay; let this sisterhood pitch in and buoy you up. Rest a little. You might be the one who said “I do” not only to a husband, but to children who call another woman mom. However, I would imagine that in your day to day, you do not “step-mother” those children…..you just mother them. Well there are no steps here friend, only seats. Perhaps you labored through mountains of paperwork and preparation and emotional turmoil to bring home your child who is no longer called an orphan. When you feel like others just don’t understand you, I urge you have a seat and tell us your story. Some of you are called “aunt” or “grandma” (by DNA or not) but you know you love that little boy or girl as if they were your very own. Let me tell you something: yes, our children need you, but so do we. Please keep showing up at the table. Others are pouring their mother love into children who will never refer to them as mommy, be it through ministry, foster care, advocacy, or even your chosen profession. Keep pouring, keep loving, and then come here to the table to be filled up again. You are vital to this village. Maybe you’re the mama bird in her quiet, calm nest, no longer filled with fluttering or chirping. Please keep your seat…we need your wisdom and your prayers and your understanding. We need you when the days feel too hard and too long to remind us that it’ll all be over far too soon. And, if like my patient that night, you find yourself as a mother to a child in heaven, I can only promise you one thing: not everyone at the table will understand your grief, but we will all understand your heart. The irreplaceable, never diminished love of a mother is our common ground. What I’m trying to say is this: Love is what makes a mama. And if your heart pumps maternal love through your veins, then you are welcome and needed here in this beautiful sisterhood of motherhood. There’s a place setting with your name on it. We may have found our seat in a different way from the woman next to us, but that just makes for more interesting dinner conversation. Today, I celebrate you and acknowledge you. All of you. You inspire me and I’m honored to sit alongside you at this glorious table. Previous Article my journaling Bible + my first G I V E A W A Y ! This is stunning, radiant encouragement that is so needed in this world. I love the idea of the motherhood spectrum and that it's our mama's hearts that define us. Such a beautiful heartfelt post! It was especially interesting for em to read as I wrote something similar on my own blog this week. Hope you will check it out – Enjoy & Happy Mother's Day! Thank you for reading, Deb! And for such gracious feedback. Thanks Ammie! I'll have to check it out. Happy Mother's Day to you as well!